Social media is all about engaging with your target market within your niche. While your communication is important, you need a visual component as well. Your social media banner is a visual representation of your brand and what you do. Your social media banner should help your business or brand drive engagement and increase conversion. This article will give you some tips and ideas for creating best social media banner designs for every platform. It serves as an information tool within your profile page. The banner guides your prospective clients to your site or landing page. It can be used as a marketing tool. The banner can be used in campaigns, whether paid or organic, to increase traffic to your site, or landing page. It can be used as an outreach tool for industry partners or allies to help with reach and awareness for your marketing campaigns. The end goal is always the same with any effective social media banner; create more awareness, drive engagement and increase conversion. 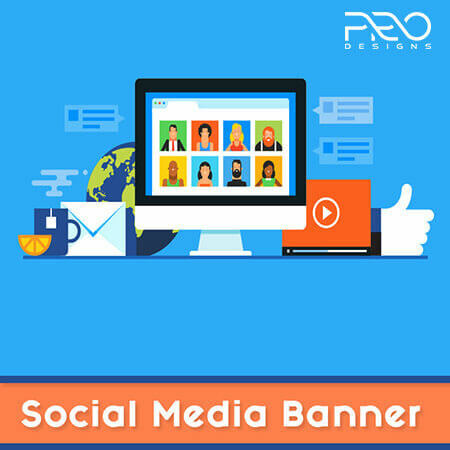 Using an effective social media banner will give your company or brand a competitive edge in the social space. Effective social media graphic design adds value to your company. Graphic design is responsible for the visual representation of your brand on your social platforms. If your graphic design is good, it can increase followers, drive engagement and improve conversion. Your graphic design team should include banners in all formats to suit the size requirements for each platform. All your social media banners should follow a typical design but be customized to size for maximum visual effect. To take the advice from professional social media graphic designers. Using a pro to handle your social media banner design, is a step toward social success. Professionals will have a large portfolio of previous work that they have done for past clients. You can have them analyze your competition and create a competitive strategy. Base the design of your own social media banners on data that shows what works for them. A social media graphic design company will work with you to develop a social media banner that presents your company or brand's identity in the social media space. They should have a solid reputation and good past client testimonials. Experienced, qualified social media graphic design professionals know what works and what grabs attention.The best social media graphic design companies will offer you three or four final design proofs to choose from. Decide on a final proof and make the necessary changes. Once you are completely happy, then sign off on the final design. Your new social media banners should be delivered to you, ready to be uploaded to your account profile, or send out to your partners to promote your profile and your brand. Your graphic design company should tailor your social media design package to your needs. You may not be active on every social platform or only need a simple header. Speak to your graphic design specialists about your needs and have them build a custom social media banner package to suit your social media requirements. Work within your budget and get the best social media design package possible. © ProDesigns - A Venture of Sukhadaam. All rights reserved.